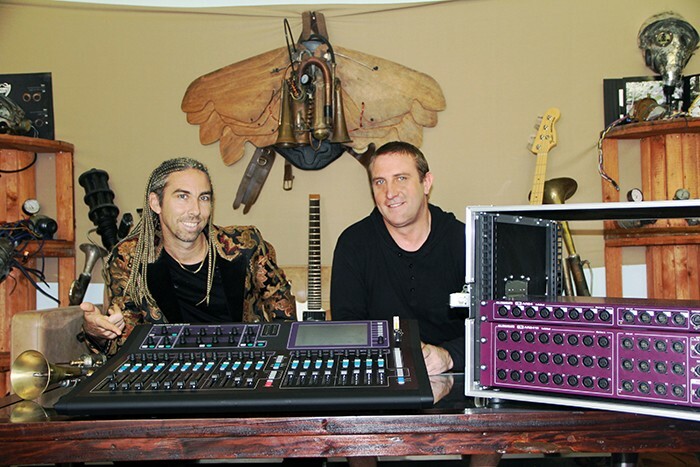 Renowned New Zealand theatrical rock act, Starboy, will be touring Eastern and Central Europe this summer with an Allen & Heath compact GLD-80 digital mixer. Starboy is a large theatrical show, blending a live heavy rock band with classical orchestration, electronic sounds and movie elements, plus dancers, Maori warriors, and pyros, lights and lasers. Consequently, production demands for the tour are high, made more complex by the logistical complexity of being based in New Zealand. "For us to tour without a digital console would mean travelling with about 30U of outboard gear, which was totally impractical and very expensive for an independent band. After investigating everything in the market, we settled on the GLD-80 because the convenience of using audio over Ethernet was so much more practical than anything else out there," explains chief engineer, Stu Fu. The GLD-80 allows Stu Fu to run the entire show with one console, fitted with an A&H Dante expansion card, which runs 64 channels of audio bi-directionally over CAT5 network cable, enabling playback and recording for duties such as virtual sound check. "This means we can reliably centre our entire performance around the console and a laptop, whilst also being able to save in-ear monitor auxiliary send settings for each artist. We can run our show from monitor or FOH position!" he says. "While the band is chilling in Ibiza between shows, if we can pull them off the beach and out of the clubs, we can capture any creative outbursts and develop it into new material to complete when we get back to Middle Earth New Zealand. Also, some of the festivals we are booked into advised that there was no opportunity for soundcheck but with the GLD-80 we are confident that the monitor mix will always be exactly as we set it up, so no surprises on stage." "The mixer does everything we need it to do, is easily integrated into other digital or analogue systems, and buying it was less than the price of shipping all the other outboard gear," concludes Stu Fu. In picture: Starboy frontman, Matt Bowden with chief engineer, Stu Fu, and the GLD-80.